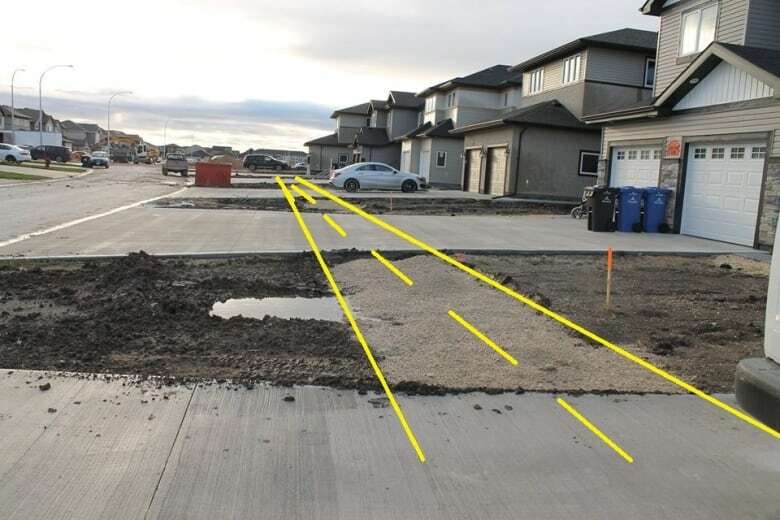 Residents of the newly constructed El Tassi Drive in Transcona are upset over plans to install a sidewalk that will cut through the middle of their driveways and have pedestrians walking within 20 feet of their garages. 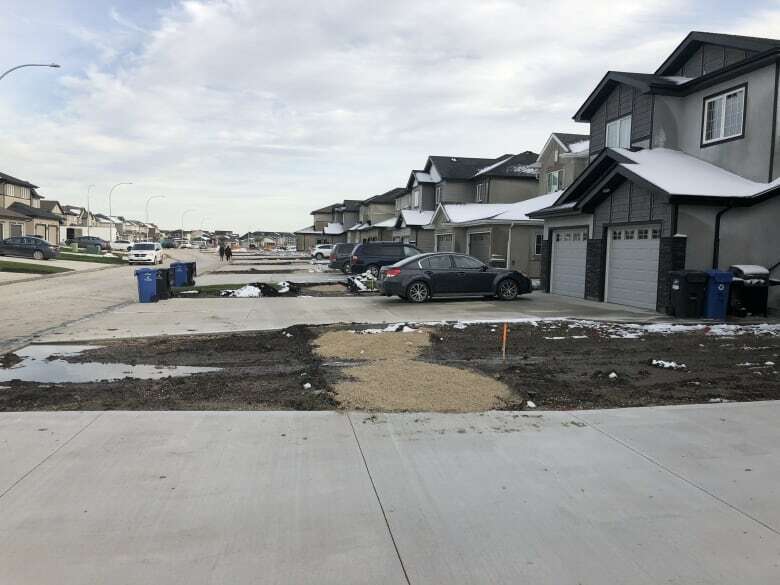 Residents who live along the south side of the newly constructed El Tassi Drive in Transcona are upset over plans to install a sidewalk that will cut through the middle of their driveways and have pedestrians walking within 20 feet of their garages. "We were never informed, never told whatsoever, that this was going to happen," said El Tassi resident Anish Rathore. "If I had the slightest idea this was going to happen we would not have purchased the house," he said. 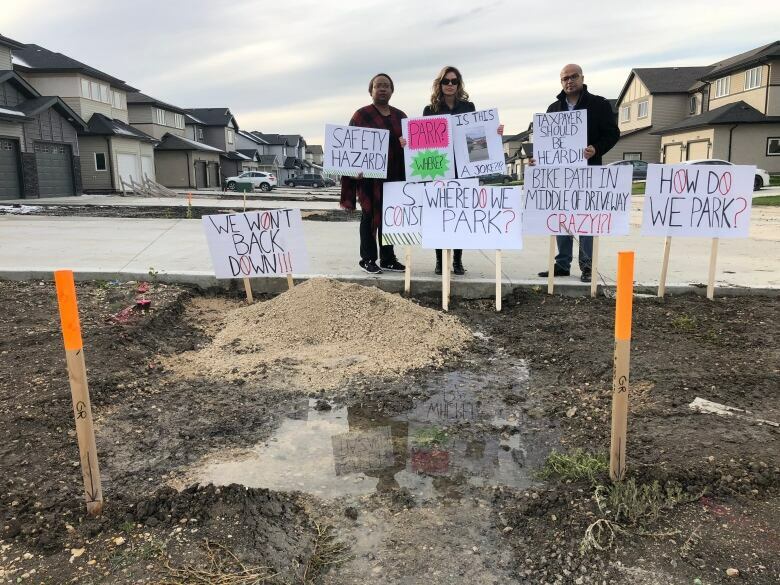 Rathore and other neighbours say they only just found out about the planned sidewalk last Thursday when construction crews began work to install them. 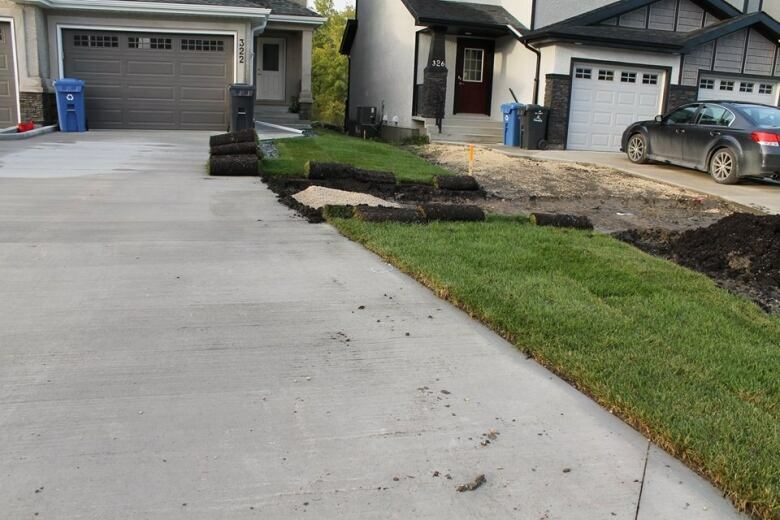 Leslyn Pinder came home to find her newly laid sod peeled up where the path was being installed. "I knew that the bottom section [of the lot] was city property but did not know I was getting a bike path or a sidewalk within 20 feet of my home," said Pinder. Residents are concerned the pathway is not only unsightly, but unsafe. "If you're reversing your car, with the limited vision, you might hit someone," said Rathore. "And it's a privacy concern, of course, because you don't want people walking a few feet away from your house." Another resident said if the plan goes through, she won't allow her kids to use the sidewalk. "It's obviously a safety hazard, it's the equivalent of telling your kids to go play in a Walmart parking lot and bike around close to parked cars," said Melanie Reimer. Residents are also concerned about their ability to park in their own driveways. The planned walkway falls within a car's length from the garage doors, and according to city bylaws, homeowners could be ticketed for blocking the sidewalk. "You would actually get a ticket if you park on your own driveway," said Rathore. Both Pinder and Rathore purchased their homes earlier this year and said they deliberately bought on the south side of the street because of the longer driveways. "One of the biggest selling features was that we had a big beautiful driveway, and we paid some money extra in order to have that, and now it seems that's all been taken away," said Pinder. The developer for the area, Waterside Development Corp., said a pathway was always in the plans and was originally a wider multi-use pathway. Waterside approached the city last October to remove the path but was denied. Instead, the city allowed them to downgrade it to a standard sidewalk. In an email sent to residents and CBC News, Donna Thordarson said the path along El Tassi was always made public, and is part of Waterside's agreement with the city. "If you were to go to our website you would see it in full display. The sidewalk is a requirement in our development agreement and therefore I am not able to change that," said Thordarson. 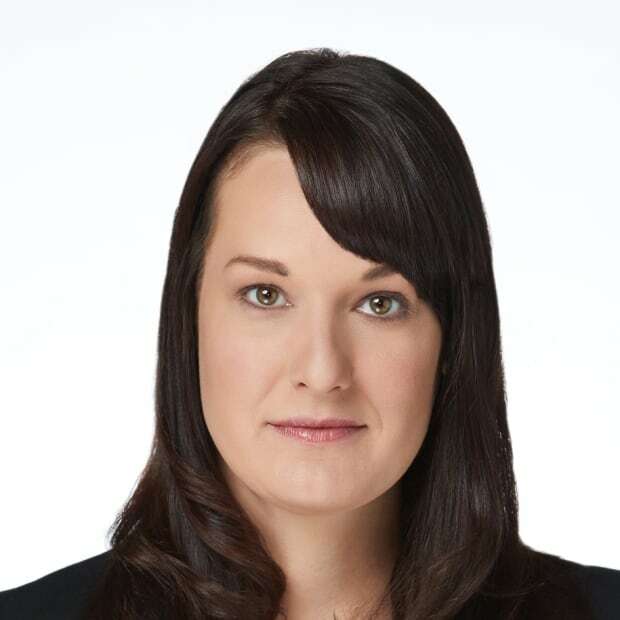 Thordarson did not respond to CBC's request for further comments about what information was made available to buyers at the time of the purchase, or if safety was considered in the planning. The city said it's standing by the development agreement as it was approved by city council, which includes a sidewalk within the public right-of-way. "Sidewalks and pathways are important in the safe movement of pedestrians and cyclists," a spokesperson said. Russ Wyatt, the councillor for the area, said the bike path was planned long before the houses went in and the inclusion of active transportation is part of the agreements between the city and developers. "Building new neighbourhoods can be a tough balance of competing needs. On a collector street like El Tassi … there is the need for sidewalks to ensure folks don't walk on the collector street and thus safe for kids or seniors walking and biking," Wyatt said. Wyatt said the demand for homes with front drives instead of back lanes creates a challenge for developers to include sidewalks. He said it also creates a challenge for snow removal for the city, and that in El Tassi's case, that larger space between the curb and the sidewalk will be used for snow storage. "Ideally we could move the sidewalk to the curb but the department of public works is refusing to do that because of the snow removal concerns," he said. The houses were built and sold by several different builders, but multiple residents on the south side of El Tassi told CBC News they were never informed about any plans for a walkway, nor were they shown drawings or plans for the neighbourhood. There are 11 duplexes on the south side where the walkway is planned and Rathore says all 22 homeowners say they were never made aware of the path. "One individual can miss out on reading the agreement, two people can miss out, three people can, how come all the neighbours, all the people on the same street had no clue what was happening?" said Rathore. "It can't be a coincidence that everyone of us missed [this]." Residents also feel it's no coincidence that construction on the pathway didn't start until all the homes were purchased. "They put the path in after everybody's house is built. Obviously we're all outraged," said Reimer. The residents are worried their property values will go down because of the pathway. 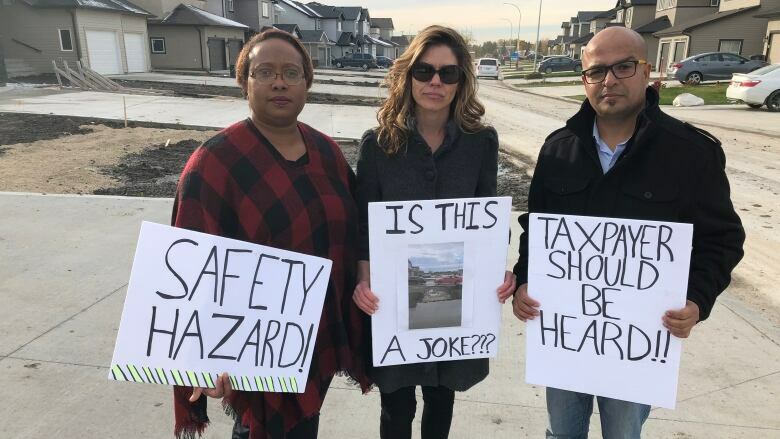 "You feel absolutely crushed because the dream house you purchased is going to have [this sidewalk], and in the future, even if you try to sell, nobody is going to buy anything like this," said Rathore. The residents have started a petition and have been blocking construction workers from building the sidewalk for the past few days. "All we're asking is we want to be heard, just don't come and destroy our homes," said Rathore. "The city has the power to change it, so we're asking for the city to step in and do what is right and fix this," said Pinder. Pinder said she'd like to see more accountability from the developers and home builders to disclose information about future plans that could impact the property. 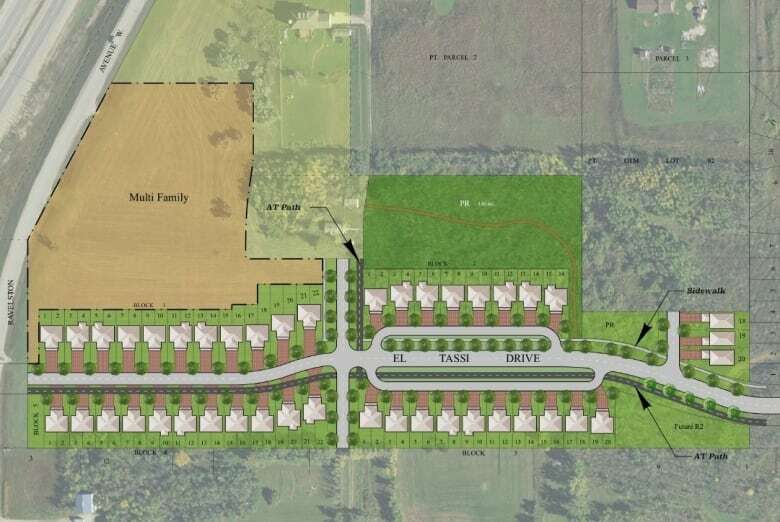 "As a taxpayer, we should have informed consent, we should be given all of the information not just part of the information,"
Wyatt agrees and said things like zoning, bike paths, sidewalks, and streets are all determined prior to the lots being created. "Ideally the developer and their home builders would and should ensure they are clearly telling their purchasers of what kind of lot they are purchasing," he said.